Has winter got you down? Warm up with this tropical drink recipe – Hot Spiced Pineapple Tea – and dream of a warm destination. Combine pineapple juice, honey and cinnamon in a large sauce pan. Bring to a boil for 1 minute. Add tea bags. Steep 2-5 minutes. Discard teabags. Don’t let the dog days of summer drag you down. 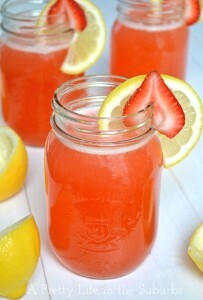 Kick back, relax, and enjoy a tasty glass of strawberry lemonade. This cool drink recipe is one the whole family will love! Place strawberries in a blender or food processor container with 1 cup water. Cover and blend until smooth. Add remaining 2 cups water and blend until smooth. Pour mixture into a large pitcher. Servings: Approximately 5 1-cup servings. Chances are you are either hosting a New Year’s gathering or attending one. And if you’re taking part in a special get-together, you’ll most likely be serving appetizers or brining a snack to the party you plan to attend. The House Plan Shop is here to help. The following appetizer recipes are some of our favorites. Happy New Year from The House Plan Shop! Enjoy! 2. Spray a 9”x13” glass baking dish with non-stick cooking spray. 3. Wrap each cocktail sausage with a third piece of bacon. 4. Stick a toothpick through the middle securing the bacon and place in the glass dish arranging in a single layer. 5. Sprinkle brown sugar over the top. 6. Bake for 45 minutes or until edges of bacon begin to get crispy. 2. Roll out breadsticks onto an ungreased cookie sheet and separate. 3. Place two or three pepperoni slices at one end of the bread stick. 4. Sprinkle with mozzarella cheese. 5. Fold remaining half of breadstick over the top, seal the end and twist. 6. Repeat for remaining breadsticks and arrange on cookie sheet. 7. Mix together parmesan cheese, Italian seasoning and garlic power in small bowl. 8. Sprinkle over the top of the twisted breadsticks. 9. Bake 8-10 minutes or until golden brown. 10. Dip in warm pizza sauce and enjoy. Christmas morning is memorable no matter how young or old we are. Add to the memories of this special day by sharing The House Plan Shop’s favorite, savory cinnamon rolls with your loved ones for Christmas breakfast. 1. Combine yeast with water in large mixing bowl. 2. Add white sugar, 3 cups flour, egg, ¼ stick softened butter, and salt and mix well. 3. Add remaining 2 cups flour and mix to form soft dough. 4. Place in a greased bowl, cover and refrigerate overnight or for at least 2 hours. 5. The next morning, preheat the oven to 375 degrees. 6. Roll the dough into a 10”x30” rectangle. 7. Cut the remaining stick of butter into pats and place them in rows covering the dough. 8. 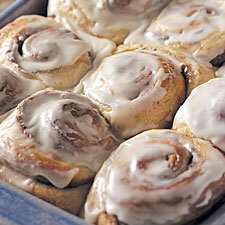 Combine brown sugar and cinnamon in a bowl and sprinkle over the dough and butter. 9. Starting with one of the long edges, roll the dough tightly into a tube shape. 10. Cut the dough at 2” intervals with a sharp knife, place into a greased round or oval baking dish. 11. Bake for 15-25 minutes. 13. Remove the rolls from the oven and ice with powdered sugar mixture. 14. Top with chopped pecans if desired. Please visit our blog next week for more holiday recipes.